Environmentally friendly digestant helps with wast build up in your drain lines and septic tank. Over time waste builds up in your drain lines and septic tank. Our special blend of bacteria help to reduce this waste. Our natural digesting micro-organisms will not harm your plumbing or septic system like chemical drain openers can. Continue to keep the environment safe by using our special blend regularly. Stock up! 2 Year Supply saves you $10 on your purchase price! Remember, a cleaning to your system and filter is important to your septic system's health. This product can help prolong system life and health. 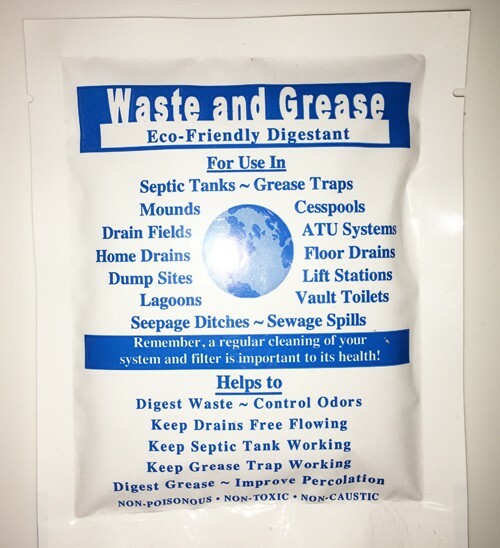 It does NOT replace regular maintenance and pumping of your septic system, cesspool, grease trap. Call Herring Septic if you need to be pumped at 845-226-5405. 12 Month Supply in Easy to Use 1 Month Packets of Environmentally Friendly Digestant. Stock up! 2 Year Supply Saves You $10 On Your Purchase Price. This Digestant helps with wast build up in your drain lines and septic tank. Over time waste builds up in your drain lines and septic tank. Our special blend of bacteria help to reduce this waste. Our natural digesting micro-organisms will not harm your plumbing or septic system like chemical drain openers can. Continue to keep the environment safe by using our special blend regularly. Helps provide natural aid to normal operation of waste disposal systems, increasing the capacity for waste elimination. Helps to eliminate odors which attract disease bearing insects. Helps to reduce gum and pectin which cause glazing of drainfields and drainage pits. Helps to eliminate soggy soil and surface puddles due to clogging of the drainfield. Helps to keep your entire plumbing system working and healthy. Helps to break down grease. Decades of proven product reliability. 1. 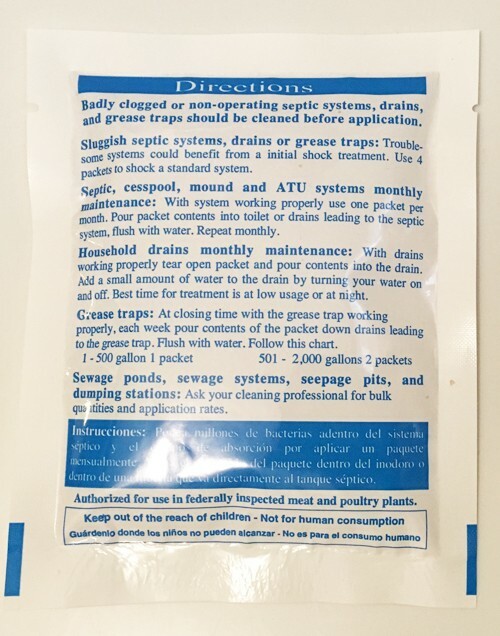 Do I need enzymes and bacteria additives for my septic system? Over time waste builds up in your drain lines and septic tank. Herring Sanitation recommends a special blend of bacteria, which helps to reduce this waste. The natural digesting micro-organisms will not harm your plumbing or septic system like chemical drain openers can. Continue to keep the environment safe by using our special blend regularly. 2. What do enzyme and bacteria additives do? 3. Why is the product you recommend better than leading brands? 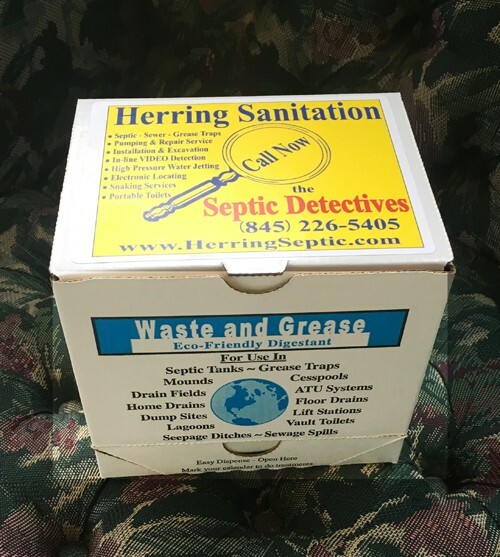 Often times Herring will send servicemen out to pump septic tanks and will observe undissolved remains of a well known product commonly sold at hardware stores. This well-known product is made up primarily of sawdust and fillers which do little to assist with waste breakdown. 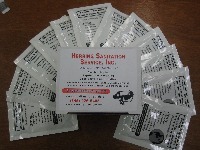 The product that Herring recommends to its customers is enzyme based with zero fillers. 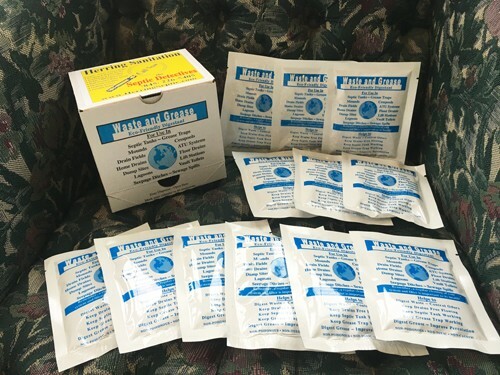 It has been designed specifically for the septic industry and has been tested carefully to ensure that it meets the many needs of septic users, including waste breakdown, hair breakdown and odor reduction. 4. Do I still have to pump my septic if I use enzymes and bacteria additive products? Absolutely. No product on the market will remove solid waste from your tank. Those that say they do are promising more than they can deliver. Standard septic/leach field system and those require pumping every 2-3 years. Enzyme and bacteria based products help to eliminate grease, odors and keep the tank working well. Nothing will stop the need to pump a septic tank regularly. 5. How hard is it to use this additive? The product Herring offers comes in 12 neat envelopes the size of a packet of hot chocolate. In residential homes, you put one in a different drain each month and it will keep you flowing. 6. What systems should I use environmentally friendly digestant (or additive) for? 7. Can I use the environmentally friendly digestant in federally inspected meat and poultry plants? Yes. Our environmentally friendly digestant is authorized for use in federally inspected meat and poultry plants.